On Sunday, Rep. Michael McCaul (R., Tex. ), Chairman of the House Homeland Security Committee, said that the greatest threat facing the United States is from individuals who self radicalize and independently carry out attacks against the West. "We worry a lot about ISIS traveling overseas from Syria to the United States, but I think one of the greatest fears are those already within the United States who are being radicalized and inspire by the ISIS propaganda that’s out there on the internet. They are waging a campaign of war against the West and the United States and these are three examples, just last week, of where they’re winning," said McCaul on ABC’s "This Week." The Islamic State (IS or ISIL or ISIS) has urged followers to act on their own to "kill any disbeliever, whether he be French, American or from any of their allies." Attacks last week in Canada and the United States have increased concern that the West may see more "lone-wolf" terror attacks. McCaul argued more needs to be done in order to prevent it, but acknowledged that violence like this is difficult to stop. "Surveillance of mosques is a very sensitive issue, but what I would urge would be that we have greater community involvement within the mosques. Remember Tamerlan Tsarnaev, the Boston Bomber, got literally kicked out of his mosque and yet there was no reporting of that at the time, and had there been, just maybe we could have stopped that particular bombing from happening," McCaul said. 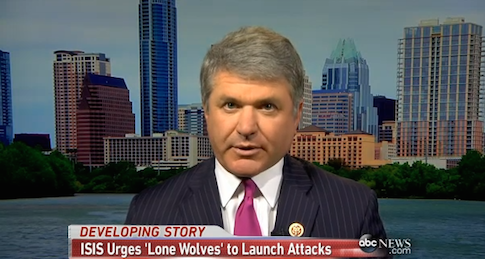 Threats from lone wolf terrorists, McCaul said, are some of the most difficult attacks to prevent, but one way to become more adept at stopping them is for the FBI and Homeland Security to work with local officials in these communities to identify possible threats early on. When asked if he thought Thursday’s attack in New York City was an act of terrorism, McCaul did not pause. "I do. I think all the markings are there of radical Islamist ties. This is the profile of the enemy within. Self radicalization within the United States." This entry was posted in National Security and tagged Islamic State, MIchael McCaul, Terrorism. Bookmark the permalink.